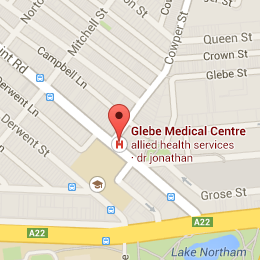 Located in the heart of Glebe, Glebe Medical Centre is founded by doctors who are passionate about providing quality medical care to individuals and families within the local community. Our vision is to provide quality holistic healthcare that is accessible to all. As part of that vision, we have a wide range of medical and allied health services available all under one roof. We are a family practice with the ability to accept appointments and walk-ins. We are an accredited general practice. Our medical practice contains state-of-the-art medical facilities and equipment, operated by Australian-trained doctors. We have nursing, onsite pathology collection, physiotherapy, psychology, podiatry, dietitian and exercise physiology. We invite you to visit us at 53 Glebe Point Rd, Glebe NSW (Opposite Glebe Markets & next to Cincotta Pharmacy) or call us on (02) 8070 6888 for an appointment. If you require after hours medical assistance of a non-urgent nature, please contact the National Home Doctor Service on 13 7425 or 13 SICK. They are a fully bulk-billing service and will send a report to your nominated GP the following day. Walk-in patients (ie. without appointment) will be seen but are privately billed at all times.